Now before we get started I'll explain, "A Not So Maternal Mom", I have NEVER been one of those girls who wanted to get married, have babies and be a stay at home mom (Not that there is anything wrong with this) I've just never had that, "Mom" thing. That urge or that maternal want, to have kids. I can probably count on one hand how many times people offered me their baby at church and how many times I wanted to hold one on the other. THOUGH I did always want a family, I just knew that it would be hard for me...and what an understatement that was. If you know me personally I am every open about my depression and anxiety (I wasn't always this way). At the beginning of 2018 I was finally feeling like I had control of my emotions, with very little episodes thanks to therapy and medication! My career was taking off, I was finishing my education and getting ready for the next chapter of life, with my husband (Boden) starting medical school the following year (2019). So it was a shock to many when we announced our pregnancy. In April of 2018 my husband and I took a couples trip with our dear friends to the B.C. to see Vancouver and Victoria. While were on the trip they announced that they were pregnant! We were BEYOND over joyed for them because they and such a rough go and it was finally happening for them! As we went to bed that night I looked at my husband and I said, "Do you think it's time?" one of our best couple friends was getting ready to have a baby and I'd imagined that our kids would grow up together. Maybe it was time? Without even thinking we decided to give it a try, one try and I cried my eyes out following. I was terrified and cried myself to sleep in fear that I was pregnant. Boden tried to reassure me, "It doesn't happen that fast!" The next morning I decided that it was a terrible idea and we needed more time, I needed more time, I wasn't ready. Though as I said the words and my husband held me, being so understand and knowing it was already so hard on me, we agreed to wait. As I cuddled in his arms I already knew the deed was done, in the pit of my stomach I knew. It wasn't even a month later that I felt impressed to take the test. I thought I would have to wait a few minutes for the lines to appear but it was seconds. In a matter of seconds the pit in my stomach became a reality. I cried of shaking anxiety but I also felt a little bit of excitement. As Boden's birthday approached I knew exactly how I was going to tell him, he was going to be a DAD! For his birthday I got him a pair of Sperry's so "we could match." Then, because I am one of those people who, if I am going to do something, I. GO. HARD. I love surprises and I love making people feel special when they're finding out BIG NEWS. I was most excited to share my anxieties with someone else (well other than the people who were in on the surprise) to have my husband know. 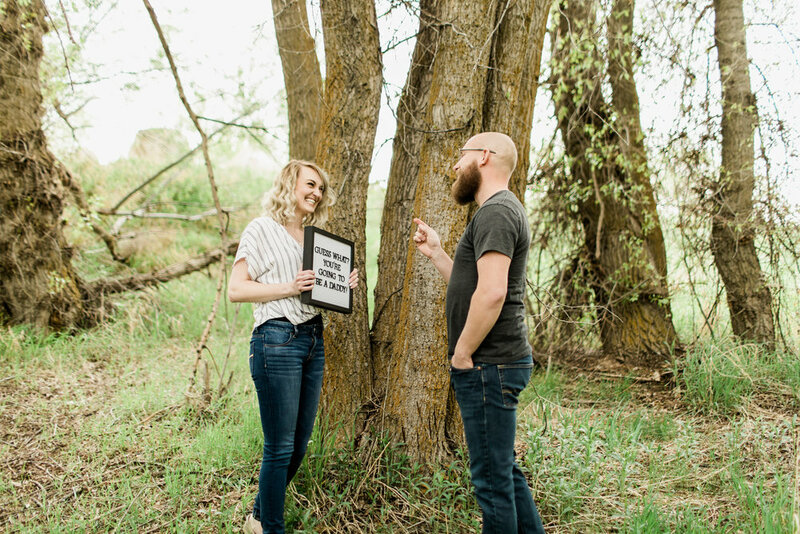 I told Boden we were going to take my graduation photos and had my little sister sneak up and hand me the sign and the tiniest of baby Sperry's. There were tears and I finally felt some relief! Once I'd told him, all of the excitement started to slow. He was away for work so often that I actually was starting to feel like I was going to have to go through the pregnancy alone. I began feeling so sick and I spent the entire first trimester in the bathroom. When I say that I mean it. I would lay on the floor or keep a bucket with me everywhere I went through the house. I rarely could leave the house without feeling like I was going to hurl. Honestly, I wanted to die most of the time. Though I was VERY sick by this time, we had the opportunity to tell each of our sides of the family in really fun ways! For Boden's family this is the first grand baby on his side and we we're able to be with them in person. I LOVE doughnuts so a box of doughnuts seemed like the perfect way to go! With a note that said, "Everyone eat up, Deanna can't be the only one with a big belly this year!" We had a good laugh as everyone ate up the doughnuts. I think Boden's dad almost died of the idea of being a grandpa but he LOVES kids so we're not too worried. My step mother-in-law was SO excited I heard her scream, "ARE YOU SERIOUS?!" from two rooms over. Even when he was only the size of a bean he was already so loved. For Boden's mom and grandma we sent baby Boo into her home with a little note tied around her collar that said, "Please read out loud. My parents are getting me my very own hooman, that means you're going to be a grandma! (And great-grandma)" It ended in tears of happiness! My family was overseas and it was a little harder to make the announcement fun. I decided to Skype them and show them the graduation photos and wait to see their reactions as they followed Boden's reaction. My sister had the first grand baby, a little girl in April of 2018 but my parents about died of excitement with the news. When Boden finally made it back to me, on a more permanent note, he was the best of the best and every time our child decided we weren't feeling good he would rub my back, hold my hair and grab me a glass of water. Now I was really struggling at this point but I thought, "This part is normal, I am going to be okay, THIS. WILL. STOP." I started to get sciatica pain and I was getting sicker by the day. I would cry for hours at a time trying to cope with the pain and the sickness but I just kept thinking, "It will be over soon!" 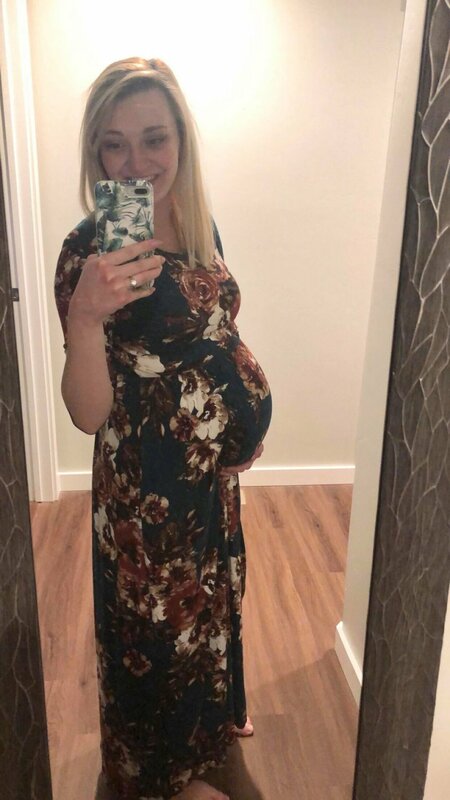 As our gender reveal came around the corner (so quickly), once we hit 20 weeks. 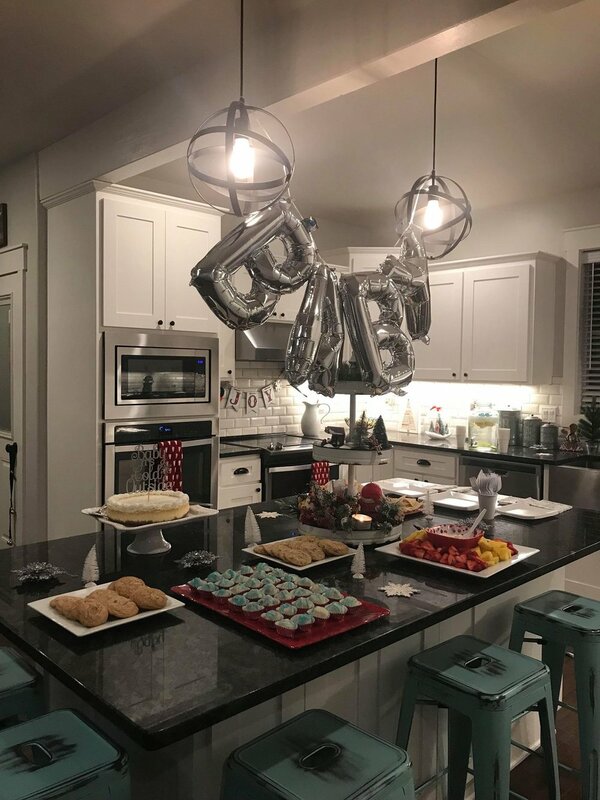 Boden's step mom threw us the most AMAZING party where we were able to fall in love with our little bump even more than we already had! We'd had a boy and a girl name picked out and honestly didn't care if the confetti was pink or blue! It accidentally turned out to be BOTH. There was a mix up with our shooters and we shoot off PINK while all the guest shoot off BLUE. After a moment on confusion I pulled out the sealed envelope and checked, we're having a BOY. Boden and I shot off blue for fun afterwards. *I couldn't help myself and needed to design the party invites! 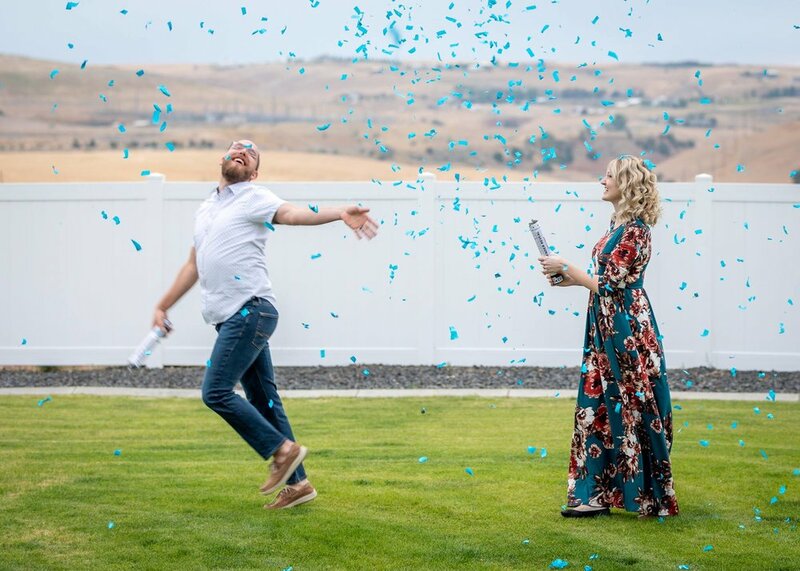 We seriously had the BEST time visiting with family and friends when we at the reveal and what made it even better was knowing that all that love would continue when we moved up there to have the little guy! We were getting ready to move by 26 weeks and decided to take some maternity photos in Utah since the fall colors were finally showing and of course, its my favorite season. I customized/ordered these shirts (and tiny bandana) for the reveal but unfortunately they didn't make it in time so we decided the use them for these photos. We were able to capture the pregnancy BEFORE I felt too uncomfortable. I actually thought (well, FEARED) that I would get water weight in my face. I was already feeling not very me by this point so I wasn't sure what I would feel or look like later on. Everyone was telling me that looked great but because I was SO SICK I didn't feel great. I absolutely LOVE these images and I am BEYOND grateful we took them. As the weeks continued on I went from daily puke sessions to weekly. THANK GOODNESS. I was still in a lot of pain in my hips and back but I thought that it would all end, soon. I was wrong. For the remaining 20 weeks I would puke weekly, I tried just about everything and it was still only limiting the amount of sickness. I tried to distract myself, go out and about. or switch it up and take rest. It didn't make a difference what or where I went, I was stick a puking mess. Unisom helped me sleep but as nights came I would have this feeling of a "frog" logged in my throat. The worst part was when I would wake up in the early AM and my poor sweet Boden launched himself out of bed to help me catch the frog. We are beyond blessed with friends and family and baby boy was celebrated not once but twice. Seriously, little man is so spoiled and so many people, even ones I didn't know came to celebrate him and help us get everything ready! We received a mini maternity session when we purchased our newborn session. It was seriously such a cold and awful day but it was fun playing dress up. These don't really feel, US, to us but it was fun running around with my big belly and having Boden dance around to make me laugh. Right around 37 weeks I went in for my weekly check up and my doctor noticed that I'd been measuring (actually, little man is who we were measuring) the same for the past five weeks. We needed to do a check to make sure that he was growing right! So I went in for a preliminary ultra sound. I'm not going to lie, I was actually a little freaked out. The ultra sound went smoothly as we measured baby's head, stomach and femur. By doing the measurements they could see that he was doing fine, he had a slightly larger than the rest of him but he's his fathers son! No need to worry he's just a little guy, we make little people. 20 weeks VS 40 weeks. It's hard for me to admit but I have gained 30 lbs, which is amazing because I haven't really been able to eat. I haven't felt a single contraction (I know! but I think I'd rather have them now over the puking), my hands/feet didn't swell, my belly button didn't push out and thankfully I only have a few stretch marks right in the middle which is one of the things that I have struggled with most. I am done (I've been done). Little man, your eviction notice has been given and you are free to join us, right now!